First thing’s first: what is this ‘productivity’ of which we speak? In technical terms, it’s the effectiveness of rate of output. In plain English, this means the speed and efficiency at which you get things done. Since when did this become so vital? In a world where ever more is expected and working or studying in a productive and efficient way is rewarded, there can be intense pressure to work all hours, skimp on play and worry about whether you’re doing enough. One of the biggest barriers to productivity is actually beginning. It has been proven that getting started on a project/revision or assignment is the hardest part. Why is this the case? Well, our mind focuses on the difficulties of the subject, whether that be word count, the question itself or organising the workload with time constraints, so we stall before even starting. Just get started – because the good news is people like to finish a task. It can weigh heavily if a task or assignment is looming over us unfinished so this often gives us the motivation to complete what we are doing. Schedule study times throughout the week/month and stick to them. As well as what and when you’re going to study you must also consider where you want to be. Distractions – whether they be social media, games, TV, family or general noise – are not conducive to productive study so create a study-friendly environment for yourself. As you become a time management warrior you mustn’t fall into the trap of procrastination. Plan in an efficient way: there’s no need for elaborate tables, colour coding and multiple formats. By making a simple, strict schedule you are preparing yourself to study. However, don’t over plan. Ensure you allow time for rest, fun, friends and study. While it may sometimes seem like the most valued of qualities, speed isn’t the most effective way to approach your studying. You might be tempted to concentrate on the part of your course you find easiest, in order to get though the work or revision quickly. However, research has shown that the most successful people succeed by concentrating on the hardest areas of the subject. Be brave and tackle the difficult areas first. Breaks and managing your energy levels throughout study sessions is probably the most important point on our list of productivity tips. 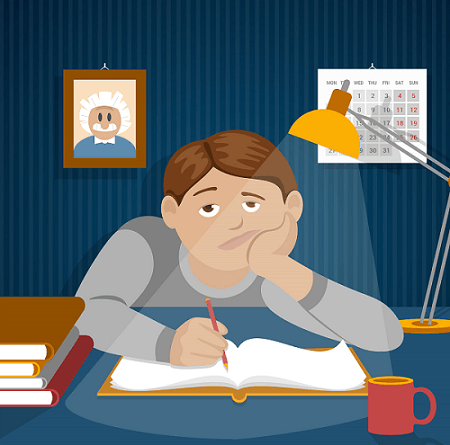 Everyone is different, so how often you have a break during study periods is up to you. However, we recommend aiming for a cycle of 90 minutes working and 20 minutes rest throughout the day. The idea is you are trying to maintain high energy levels and keep the brain open and prepped for learning. The importance of not going through a full day’s study without regular breaks was proven in the 80s by Francesco Cirillo. 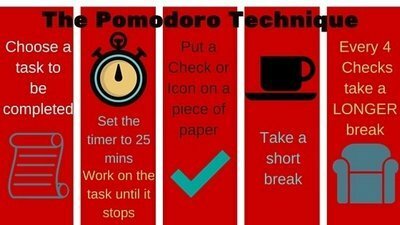 This study came to identify the Pomodoro Technique (find out more here) and is still used widely today. This is a time management approach where you use a timer to allocate working slots – and so improve efficiency and productivity. 1. Decide on what you want to achieve/work on. 2. Set a timer to ‘n’ minutes (anything from 25 to 90 minutes). 3. Work on the task until the timer rings. If you get distracted or your mind wanders during the allocated working time, write it down and get back to the task. 4. After the timer rings, put an icon (it’s up to you what the mark is) on a piece of paper. 5. If you have fewer than four icons, take a short break (3–5 minutes), then go to step 1. 6. Once you have four icons take a longer break (15–30 minutes), reset your icon count to zero, then go to step 1. It’s tempting to pull all-nighters (and party as hard as you study) but you will not be in tip-top shape if you’re tired or feeling unwell because you haven’t been eating or sleeping properly. It’s also more difficult to concentrate if you’re hungry or tired. Don’t skip meals – instead try to eat a healthy, balanced diet, as heavy, unhealthy meals will only make you lethargic. Keep returning to the original brief, re-read your notes from previous days and keep a log of what you’ve accomplished. By doing this you will start to make better notes while you study naturally. This reviewing process ensures you don’t get lost, miss key requirements, build on previous learning and feel motivated. Accountability charts – that map out what you’re going to achieve and by what time – are very useful. These can be simple drawings on a wall white board or in a pad. It doesn’t have to be a thing of beauty (remember you’re not getting graded on your time management or study organisation). Plan for the next day the night before. This means you will hit the ground running every day. You’ll also sleep better if you’ve brain dumped before you hit the sack. Strict deadlines are also imperative to ensure you reach targets and are able to stay focused to satisfy your goals. When you’ve finished blocks of work or a significant deadline, give yourself a small reward to keep motivated. Carried out correctly these productivity improvement techniques can completely change your behaviour. They not only help prepare you for a specific assignment or project; they’re about training yourself in how to be more productive in work and as a person, generally. Found our guide to how to be more productive helpful? For more study-related advice, check out our top tips on revision and time management pointers.